French composer and pianist (Honfleur, 17 May 1866 – Paris, 1 July 1925). 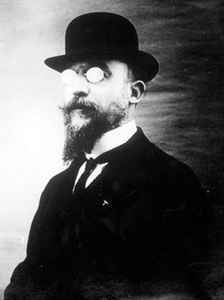 Starting with his first composition in 1884, he signed his name as Erik Satie. A colourful figure in the early 20th century Parisian avant-garde, he referred to himself as a "phonometrograph" or "phonometrician" (meaning "someone who measures (and writes down) sounds"), preferring this designation to that of "musician," after having been called "a clumsy but subtle technician" in a book on contemporary French composers published in 1911. Later, from the 1940s on, predominantly John Cage presented Satie's work as that of an inventor of a new and modern musical expression, and so he was slowly rediscovered and became a precursor to artistic movements such as minimalism, repetitive music, ambient (called "Furniture Music" by Satie) and the Theatre of the Absurd. In addition to his body of music, Satie also left a remarkable set of often humorous and witty writings. Erik Satie : so many releases however which ones are most relevant & essential to buy ? I will buy Satie's Gymnopedies and Gnossiennes Lp. Has someone there? Inherently synaesthesiological writing and playing, almost proto-psychedelic with an absinthey hue, emerging alluringly from a lilac cloud of opium...one can almost smell and taste the lilting pastels of his keys, almost feel the tender velocity of their depressions, so essentially impressionistic, like his fingers are touching your mind as the shimmering rainy morning cast of watercolor bleeds under gracious droplets that swell and meander. Probably one of the best writers and players of the pianoforte despite barely qualifying as a virtuoso...the music is so FELT it almost supercedes the pyrotechnics of a superior technician like Rachmanninoff out of sheer sensitivity; with Satie one is always aware that every fiber of his being inhabits the ivory under his touch and with eyes closed we are contacted by every strike of his dulcet hammer. Satie is arguably one of the most universally undislikeable composers there ever was and reminds us that sometimes the best writers of music are not necessarily native talents to the medium, as if he was drawing a picture with every piece. His Gnossiennes, Ogives, Sarabandes and Gymnopedies are beautiful. "Erik Satie (1866-1225) is one of the most important figures in the Twentieth century music. His influence extends from the French impressionists Debussy, Ravel, Poulenc and Milhaud, through John Cage and modern minimalism. The timeless quality of his music is marked by its extreme simplicity. Satie was a loner who earned his living as a pianist in the cafes of Montmartre, an eccentric who always dressed in a gray velvet suite and a bowler hat. By the turn of the century, he became known among the Parisian artist community for his odd and witty piano pieces. Satie was a distinctly French precursor of Dada and surrealism. His collaboration with Jean Cocteau and Pablo Picasso resulted in a series of ballets that amused some critics and angered others. One piece, parade, was borrowed from the populair music hall and incorporated the sound of a typewriter, a revolver, sirens and a xylophone made of bottles. His final ballet, Relache, was a surrealist creation. Patrons were invited to an opening night in wich the theatre closed. After years of too much drinking on the cafe circuit, Satie's health began to fail just as his fame began to rise. He died of cirrhosis of the liver at the age of 59." Taken from a Satie cd inlet.